Since the advent of contemporary homelessness in the early 1980’s, over 35 years ago, local governments across the country have “swept,” moved along and arrested people with no housing for the crimes of sleeping, sitting, loitering and protecting oneself from the elements (camping). Even while everyone from the Federal, State and Local Governments, to the Local Homeless Coordinating Boards and Service Provider Coalitions, to Advocacy Groups for Housing, Disability Rights, Homeless Led groups, National Groups, Statewide Homeless Coalitions, and even many Business groups – literally EVERYONE – identifies that the systematic dismantling of our nation’s affordable housing, as well as healthcare and income support programs, is the cause of why so many people from different geographic and social backgrounds are forced to live in our public spaces these days. The Denver Homeless Leadership Council is continuing a 35 year pattern that homeless people themselves have grown to truly resent. Mayor’s Task Forces, HUD Coordinating Boards and now local Leadership Councils keep trying to rearrange the chairs on the deck of the Titanic. All the while professing “they” know best what it is homeless people need and if the City would just give them more money, they could fix all the homeless people and make the problem of homelessness go away. Even a cursory glance at the Federal budgets for Housing and Poverty programs clearly documents that it is going to take more than another “remodeled” shelter system or a new 5Year Plan, 10Year Plan, Chronic Homeless Plan, Navigation Center or Coordinated Intakes to turn the tide of the continually growing numbers of people in our communities with no alternatives but to band together and fend for themselves. 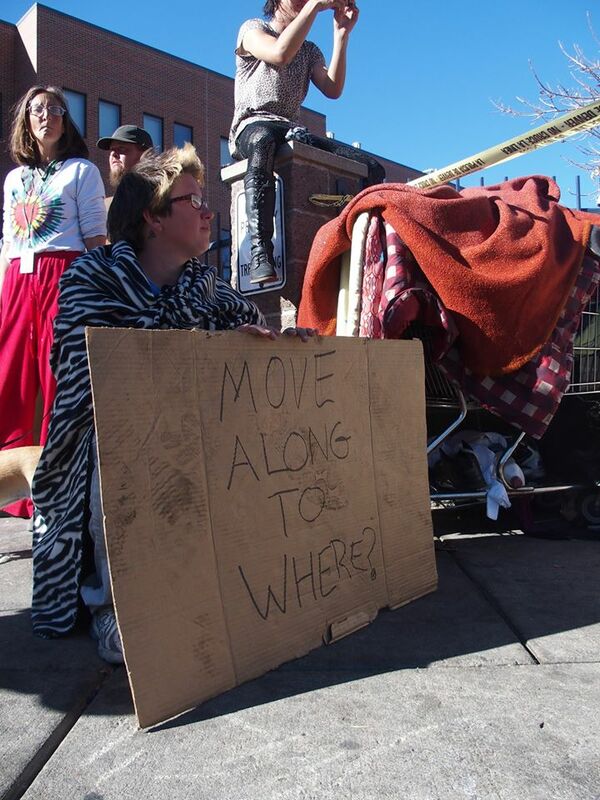 Even if the city funded all the projects named in the Leadership Council and Colorado Coalition for the Homeless statement, this would not house – or shelter, which is not comparable with housing – even half of all those in need in Denver right now. People will still be living on the streets. True leadership would be to defend the right of people, regardless of their housing status, to conduct the life sustaining activities that every single one of us most conduct, and that most of us, at least for now, are able to do in the comfort and privacy of our homes. To both recognize that criminalization of rest causes harm on the homeless community, and at the same time take no action, make no demand or even suggestion to end this inhumanity – this is not leadership. Homeless people did not conduct a dastardly plan to create homelessness in America nor has the Human DNA changed such that living outside is considered a cool and desirable thing to do. When Congress approved President Reagan’s 1980, 1981 and 1982 Budgets that almost wiped out Federal funding for low income housing programs, there were NO homeless people in either the House or the Senate voting on those budgets. Just the opposite, by 1983 there were people protesting in the streets against these cuts! Just as in 1998 when Congress passed, and President Clinton signed, Welfare Reform Bills (Contract With America), poor and homeless people had no vote on that either. Clearly we must all admit, Homeless people did not create contemporary homelessness. So the question then is – Why are homeless people the only ones who are going to jail for the fact that homelessness exists? Homeless people are demonized, ostracized, dehumanized and inevitably criminalized merely for living in a era when our government, over the last three decades, has decided to abandon any pretense of a social safety net. This pattern of negligence, also known as “Trickle Down Economics” has massively benefited and enriched the wealthiest Americans and corporations, over the same three decades. Homelessness is the price we pay when policies and funding priorities are intended not to serve ALL people but to disproportionately benefit those deemed more worthy of government largess. In this environment, a plethora of non-profit corporations/coalitions and think tanks have formed to serve as middlemen between those on the benefitting end of the status quo and those suffering the degradation of neo-liberal politics. Homeless people and their allies put the Right To Survive Initiative on the ballot ourselves because we know that those who profess to be our leaders and who pontificate on our behalf do not work for the systemic change that is so blatantly required to actually address the causes of homelessness and not just the aesthetics of our existence. In the statement they say they don’t like the divisiveness of the campaign and wish people would just “work together.” The only people who win by not being divisive are those with money and power who strive to maintain the status quo. As poor and homeless people, we don’t have that privilege. We have to fight for our rights. We cannot stand for a status quo where people cannot use a blanket to stay warm. We cannot stand for a status quo where being visible and poor is a crime. We all need to sleep, rest, eat and protect ourselves from the elements, when we are doing so in a NON OBSTRUCTIVE manner, where is the crime? 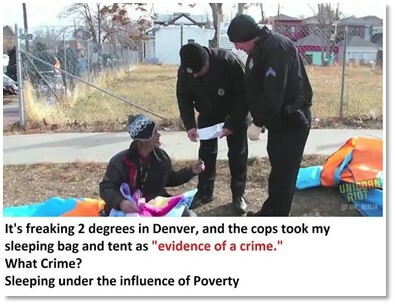 ← LANDMARK SETTLEMENT REACHED IN THE DENVER HOMELESS SWEEPS CLASS ACTION!! I’d really like to see a statement acknowledging the concerns of the community (fellow people living under the capitalist system who’ve worked hard to afford, in some cases barely, to keep themselves homed). 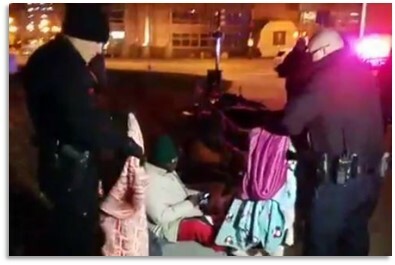 Does the homeless community intend to self police the state campsites are left in, drug paraphernalia left where children can find it, the aggressive panhandling, the theft etc some of its members do? I had no issue with the camp set up last year near the Westworld offices, I chatted to a bunch of those folk and they were great. Except, that is not the norm.